The Gigavent® window opener is our largest and strongest opener in our window opener program. Due to its large hydraulic cylinder, it is capable of lifting very large and heavy vents. The hydraulic cylinder is a special cylinder that has optimized heat transfer capabilities due to its 12 protruding fins. That way the reaction time of the opener when the temperature changes, is kept at a minimum. The Gigavent® window opener is supplied with a unique damper that has a strong and powerful spring built-in. This combination will simplify the design and make the opener a lot more compact. The damper and the spring will handle even large window in strong winds and gusts and prevent them being ripped open. 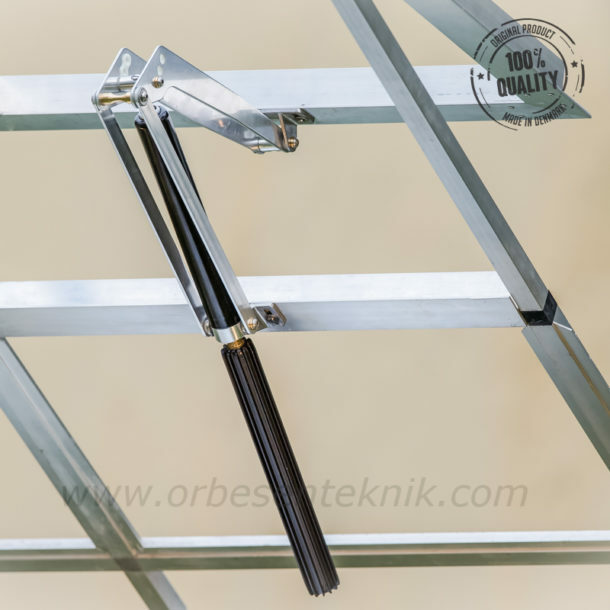 In order to improve the flexibility of the window opener, it can be assembled in a wide variety of configurations.This could be for example if you need an extra high opening of your window, or if you need some extra opening force. Like all our other openers, the opening temperature of the Gigavent® window opener can be steplessly adjusted easily without us of any tools.